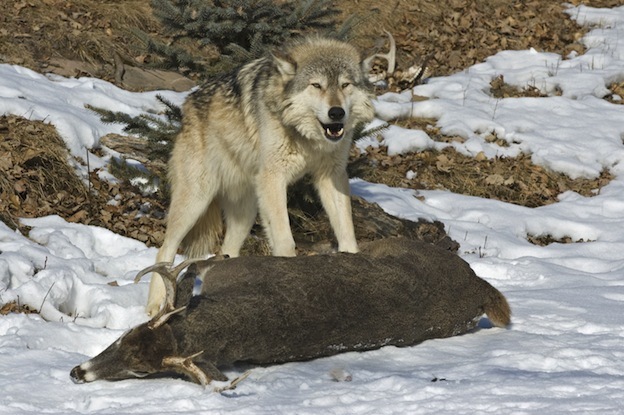 Wolves feed on meat, and lots of it! They are on top of the food chain so they really don’t have too much to worry about out there. The fact that they are strong and that they are in groups means that most other animals out there leave them alone. You may be surprised to find that they can consume up to 20 pounds of meat in a single feeding. Yet finding food for them isn’t always a daily thing. That is why they will take what they can get when they can get it. Wolves hunt in a collective effort of the pack which is why they are able to successfully kill animals much larger and more powerful than they are. Wolves do need to be careful though as serious injuries and even death can occur if they get kicked in the head or vital organs from prey they attempt to take down. Being in the right place when a kill is occurring is important of they are going to be able to walk away from the event unharmed. This is why you will find the wolf to be a very careful and considering hunter. While they can take down very healthy animals they are going to try to search for those that are old, young, weak, and slow. They can run up to 60 km/hr but most of the time they will be seen moving at a trotting pace of about 10 km/hr. They can continue at those top speeds for about 20 minutes. What wolves have access to out there depends on the location where they happen to live. For example in some areas they are able to feed on moose, elk, and deer. Other times they are known to consume family pets such as cats and dogs. Cattle can be come a meal for them which is also why wolves and humans have had a long battle for decades. When these larger types of food sources can’t be found, wolves will eat smaller ones. They can eat snakes, various types of mammals, birds, lizards, frogs, and even some types of fruits and plants out there when they are struggling to find enough food to live on. Wolves have 42 teeth in their mouth when they are full grown. They have very powerful jaws that allow them to interlock. As a result, this means they can bite prey and hold onto it while it is struggling against them. In reality, prey has very little chance of surviving such a powerful attack. It may surprise you to learn that even with power and speed they don’t always end up being successful. The prey they do capture they take down but many animals get away from them. Even a pack with plenty of great hunters can sometimes find it is very hard to get enough food. When they do go out hunting, the pack strategically comes up with a way to ambush their victims. Even so, it is possible for the prey to get away from them. Wolves will continue to try to find new prey though as they don’t give up easily. When it is time to eat they swallow pieces whole most of the time. They have sharp molars that allow them to rip foods. They also have some flat teeth that allow them to crush up bones. While the wolf pack goes to hunt, a few members will remain behind to watch the pups. When the hunters return they will have already eaten. You may observe the young nipping at their snouts. This is because the adults that have fed will begin to regurgitate meat for the young ones to consume.